The IPCC "Delinquent teenager" gets air time | Watts Up With That? Donna Laframboise is interviewed on SunTV about her new book. 7:40, but well worth your time. Click image for the video. 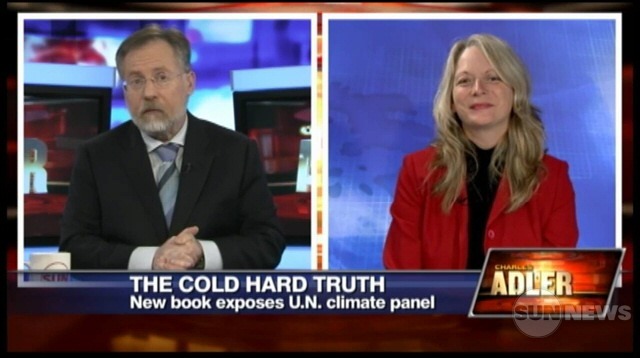 Tom Harris at ICSC writes: Toronto-based researcher Donna Laframboise deconstruct the UN Intergovernmental Panel on Climate Change (IPCC) on Charles Adler, Sun Media TV. 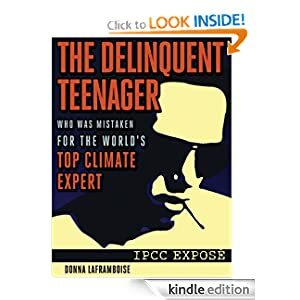 Ms. Laframboise is the author of “The Delinquent Teenager Who Was Mistaken for the World’s Top Climate Expert“, a book that describes how the IPCC includes green lobbyists and others too biased, or too misinformed to have any place on such an important UN body. Ms. Laframboise maintains noconsensus.org, a website that argues that there is no scientific consensus on global warming. If you haven’t got the book yet, now is the time. A free Kindle reader for PC and Mac is available too. Woohooo….I am 40% through and the facts and personalities are all there for checking. Great that she gets attention….and the book gets the ppublicity it deserves excellent work and everyone should know what has been going on. I have only recently become aware of all this and I am mightily outraged. The money and the attention that this has had distracting from so many other things that should be getting done. It IS criminal. Brilliant! Of course, the Sun News Network is vilified by liberals everywhere, so doubtless it will not wash in the eyes of the true believers. This is the beginning of the whitewash campaign from the UN, and the Fun begins! I wish her all the best, I just hope enough uneducated voters/taxpayers understand what a sham the whole Climate Change movement is and vote for a change in Politics instead of Climate. As an Aussie, I fear our country has already started walking the plank with our Carbon Tax incoming. We can only hope this travesty doesn’t last and people rise up against the biased, socialist greens and let common sense prevail. The IPCC was the “Key” that politicians are using to open the door to socialism and increased bureaucratic control of their constituents. The more the IPCC is shown for what it is (an environmental groups bible) the more chance have of brave politicians out there to try and win the “deniers” vote. Being only 30, I find it insulting that in the last 200 years we have had such innovation, such inspiring work by very intelligent people which has allowed the human populous to do things not even dreamt of 100 years ago. Obviously with anything new, some things mightn’t of been the best idea in hindsight, but there is a clear line between being over conservative and overburdening our environment. I just wish for all these greenies that live in their big houses (made out of timber cut from forests or bricks made from extracted earth) that are reading this blog using a computer (made from extracted minerals and oil) which is powered by coal and nuclear power, would take a step back and realise that sure, lets keep an eye on how things are going and not overburden the environment, but realise that obviously for the things we have the environment cannot stay identical to how it was 100 years ago, so doing stupid things such as turning off efficient, economical and well supplied Coal Fired Power stations to rely on wind or inefficient solar panels is just dumb and irrational. Now all Donna has to do is announce she’ll send an article for peer-review at Nature or Science, then “The Delinquent Teenager” will have the same scientific weight as the work by a Dr Richard Muller. That is an excellent interview. Good old Josh got a look -in too. OK, I finally get it. The delinquent teenager IS the IPCC. I might have to get the book. That was weird listening to people who sound almost like Americans but strangely odd [*]. Canada is a bit like the other side in Fringe, mostly the same, but different. I like their term, “decided science”. Very good info. * Yes, I know, from Canada to Chile we’re all from the Americas, but we have no fully unambiguous word naming people from the USA. Perhaps that’s why people prefer to say what state they are from. Once upon a time I was proud to say I was from California. ..the MSM is going to start looking real bad over their bias on “global warming”. great book, easy reading and quite disturbing for anyone who is willing to look at the facts. omnologos says: Now all Donna has to do is announce she’ll send an article for peer-review at Nature or Science, then “The Delinquent Teenager” will have the same scientific weight as the work by a Dr Richard Muller. JK: Right out of the Al Gore zombie’s play book: accuse the realist of not being peer reviewed (as if Al ever was). In case you didn’t notice, the book is NOT a science book. It is a book documenting the deceptive practices and lies of an organization. Why would such a subject go through the peer review process at a science publication – it is journalism which is distinctively different than science? It takes two grocery receipts to determine a trend, but if you only have one receipt, you can always adjust the receipt you have and use it as data for a second receipt, right? * Yes, I know, from Canada to Chile we’re all from the Americas, but we have no fully unambiguous word naming people from the USA. English doesn’t, but Spanish does: estadounidenses. However, AFAIK, most people in Latin America refer to people from the United States as americanos or norteamericanos. Perhaps that’s why people prefer to say what state they are from. Well I have thought for a long time that the reason that citizens of the United States of America were known as “Americans” was because their country is the only one in both continents with the word “America” in it. Yes SamG, I heard that as well and had to go back and listen a bit more carefully before I got ‘student theses’ – but I think what I heard first was nearer the truth…..
Donna is calm, reasonable and tells the story directly and clearly. She answers questions well. I would love to see her debating with some of the more alarmist greenies. I think she would be very effective. DLaF vs Pachauri would be a ticket to cherish. Rudd said climate change was the geatest moral challenge of our age – but dropped his ETS (emmissions trading scheme) once it was apparent voters weren’t impressed. So much for the geatest moral challenge of our age. Doesn’t that say it all about the politicisation of science? Our former Prime Minister really believed that the IPCC was comprised of 4000 scientists. Why was he so badly advised? Why are so many prime ministers and presidents around the world being ill-advised? The only head of state sceptic I know of is the President of Czechoslovakia. How can we counter the ignorance of politicians? You know, the people who make the laws? The carbon tax laws? The commitments to renewable energy targets? The people who legislate for subsidies for inefficient windfarms and rebates for expensive solar systems? Who, in Australia, actually want to stop the mining of high quality black coal which was Nature’s gift to us. We have centuries worth of high quality coal. Please excuse me for a moment [she goes outside and screams Aaaaaaaggggghhhhh!]. I think more TV interviews like this will be scheduled, now that she’s shown she handles herself well. Her book is about something the average viewer can understand and about which it will be hard for warmists to muddy the waters. These interviews will lead to additional book sales. The recent serialization in Canada’s National Post may tempt US publications to do something similar. I’m hoping for the WSJ or–ideally–the Reader’s Digest. The latter would make a big impact. …and “American” feels fully unambiguous to this American. Got the book and read it quickly –it’s quick work with easy style and good structure. Am now re-reading for detail and confirmation of the sometimes-stunning points she makes. I had little respect for IPCC back in 2009 when Climategate broke and Copenhagen showed Pachauri to be a clown; but Donna’s book really finished the job. Without the research and back-up her claims would seem ludicrous; but with them, she has broken a very big story. I don’t see how IPCC can survive these allegations, nor should it. Try Merkin. As in ‘I’m a Merkin’. Only works with a Merkin accent though! Merkin? You must be from Maryland. Maybe Balmer. This is all a waste of time. 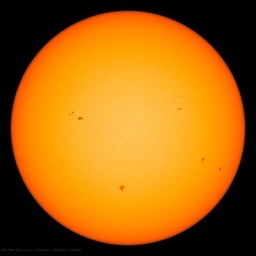 The AGW liers know they are frauds. And the MSM are knowingly protecting them. The problem is that there is no one with the political Will to demand or propose criminal prosecutions. Many $billions have been wasted on a co-orginated, planned and deliberate fraud, and no one has the guts to demand these people be brought to account. Until we start protesting in the streets demanding jail sentances for these criminals, the AGW hoax will go on, and the MSM, academia and politicians will just ignore us. The GOP and other “conservative” parties around the world will throw us a bone every now and then, but none of them are prepared to bring the fraudsters to account – because the entire MSM, academia and political class will turn on them. As a Brit I find Yank or Septic (Cockney rhyming slang : septic tank – yank) works quite well. ‘Cousin’ is quite good for a Brit too (comes from the revolutionary war; when the rebels were known as Cousin Johnathan to the Royal Navy and British Army). Of course; the use of ‘American’ helps disguise the inability of the non-yank to work out a canuck accent ! This book finally prompted me to download the Kindle app for my iPad and buy the book last night. I’m only 4 chapters into it, but it reads very well and promises to be quite enlightening. I expect I’ll learn things I don’t know, and I’ve read up plenty on the problems and issues with the IPCC and their sloppy, biased work. Clear your schedule. Based on that Sun interview then you are going on a world tour. No problem watching it here in Australia. Australia’s Prime MInister, Julia Gillard, has introduced a carbon tax in Australia, having relied on the IPCC’s ‘climate bible’. She, together with her Climate Change Minister, Greg Combet, and all her watermelon colleagues, should be forced to read “The Delinquent Teenager”! Like many other North Americans (about 1/10th at last count), I was born north of the USA border in that quaint corner of the continent spelled C eh N eh D eh N eh. We are polite and thoughtful, and often skeptical – like La Framboise, McKittrick, or McIntyre. Mervyn- why read the book? They can see a delinquent teenager in their own respective bathroom mirrors, every day. The only head of state sceptic I know of is the President of Czechoslovakia. The name I like the best for citizens of my good old USA is ‘gringo’. It has a certain charm. The Australian Prime Minister needs instead to be forced to read the next election vote tally out loud and in public. As do our own Merkin (love that word) politicians who attempted to shove this UN IPCC nonsense down our throats. And Canadians, you’re *too* polite. Seriously, you can be too polite, its true. Did not Frank Lloyd Wright suggest that citizens of the US be known as Usonians? Ending, perhaps, in testimony to a congressional committee, along with other IPCC critics. It would play well in Peoria. IPCCers should be invited too, to explain themselves. Choo-choo would be a hoot. OK, How about “Wierd Al”? Maybe Yankovich will share it. I bought my iPad a couple of months ago. Got the Kindle app. Since then have downloaded eg Watermelons, The Hockeystick Ilusion, and The Delinquent Teenager amongst others. To quote Antonia “aaagggghhh!” In my despair I cling to the tentative hope that many of the millions of iPad users will do much the same. Sunlight is the best disinfectant…. I have been yelled at SO much that the IPCC is an august scientific body, it makes me sick. People assume that there are thousands of climate experts out there. There are actually rather few, probably way less than 100 and only a handful that are honest scientists who let the cards fall where they may. It’s like helicopters after a bad hurricane with flooding. People assume that there should be helicopters everywhere rescuing people. There are, in fact, a limited number of helicopters in the world. A finite number. You cannot have more than there are. The IPCC would lead us to believe that there are thousands of climate scientists. Also, sure we have helicopters attached to many hospitals, but we cannot pull them all away to a disaster and leave the rest of the population without. There will still be the normal number of accidents and heart attacks that need to be handled. Thus, usually only the military can spare some helicopters and even then they keep some back as they cannot leave the country undefended. She held herself well. Great video. Thanks for the link. Wonder if Rex Murphy a journalist, should be added? Why should anyone seriously consider that the ipcc will change, or be wound-up (dissolved) as a result of this book ? The politicians already know that the science is, and always has been, wanting for facts and truth. The ipcc was established BY politicians to give a veneer of respectability to their anti-freedom-anti-democracy slant. After all, for many decades now we (everyone, everywhere) have had the elections, followed by the reneging on promises, followed by downright lies. Just because someone has been elected does not mean they are democratic. Here in the UK we have three main political parties. The distance between each is so small that they may as well be a single entity. All are dedicated to wasting billions building big fans to chop birds to pieces, while somehow thinking that people will not notice that a quarter of their bill is to subsidise an industry that exists to waste money. Take note: not a single snark out of her; just competence and focus. She doesn’t try to channel nancy grace and it’s totally refreshing. First question: Does anyone out there have any contacts at Fox News? I can’t see the MSM touching this but FOX viewership is bigger than the rest of the US TV MSM combined. A similar interview on Fox would reach a very large audience. Second question: Are there any resident experts in YouTube posting? Can the SunTV interview be posted in YouTube without running into intellectual property issues? If the answers are yes then would one of you do it and post the link on WUWT? You go, Donna! I can hear you roar from my house. Donna has done an important contribution by writing this book. People from the USA are Merkans. This book is a great read, especially for Australian farmers who have had their land stolen by the Australian governments with no compensation on the premise of dangerous global warming which used the ‘hockey stick’ as a visual aid to promote the Kyoto Protocol. Actually, in the movies where there were people shouting “Yankees go home”, the set for the filming was at a Boston Red Sox game in Boston. Wow that was a great interview. She comes across as a concerned citizen and meets the attack by WWF with some very concerning facts. She is so calm and cool. I feel like I just saw the IPCC Titanic hitting an iceberg. This is history in the making! David Letterman should ask Donna to be on his show. If you’ve watched any of Al Gore’s appearances where you see Dave fawn all over Al, you know that Dave worships at the Al Gore altar. I think Donna might survive Dave, just by being clam, clue, and corrected.